The upcoming Dorkbot session is a collaboration between Dorkbot SL and Dorkbot Paris, and will take shape as a Mixed Reality Event, in Paris and Second Life. 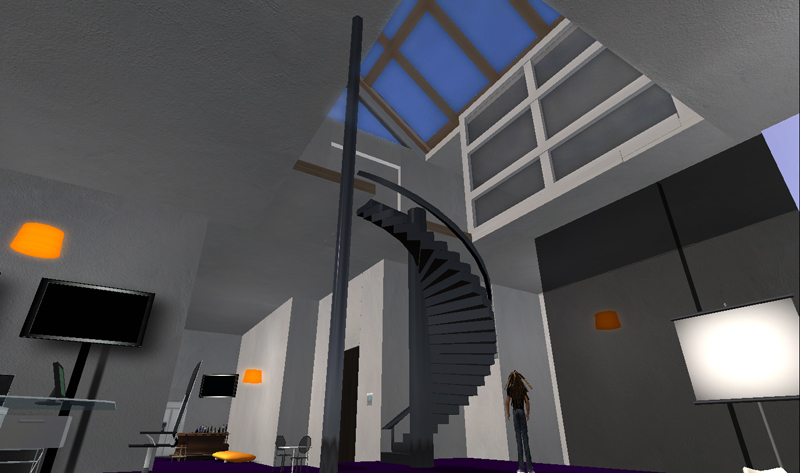 The Dorkbot Session will take place 21 March 12:30 pm PDT / 20:30 CET and start in Second Life at the Odyssey Simulator! In Paris it will be at La Cantine Numerique. During the session we’ll be teleporting to other locations so please IM Evo Szuyuan if you don’t find anyone there. From Paris Maxime Marion will be presenting the records project, and Nicolas Barrial from extralab will present La Cantine Virtuelle (La Cantine in Second Life). From Second Life Berardo Carboni will present the Volavola project, and Second Front will perform Minotaure. Numeric artist and musician Maxime Marion will present his musicometer project which allows to generate music from algorithmes. automaticaly generated by computer software. and Fau Ferdinand aka Yael Gilks. Avastar (published by Axel-Springer, Germany) and in Exibart (Italy). fight in a padded room, a mental hospital scene. Berardo Carboni (1975) has taken a degree in law, he is scenario writer and director, and he has made several shorts and documentary films that have been chosen for national and international festivals. He has worked with Lara Favaretto to the making of videos for the art circuit; they have been awarded prizes inside important environments (Furla Prize, Venice, 2001; P.S. 1 studio program, Muma, New York, 2002). Together with Lara Favaretto he also worked in 2003 at his first full-length film, Buco nell’acqua, a TV-movie with Sandra Milo, produced by Mediatrade. characters, both computer generated and in flesh and blood, are all playing different roles throughout the entire picture. Finally, Volavola also deals in a sociological way, sometimes even surreal, with themes such as hacker ethics or the values shared in a virtual society, topics which are too often left out by science-fiction in general. The main message is to defend those values, as they play an important part in our cultural heritage by helping us to build a better place to live for everyone. The entire film will be set in Rome as the actual city and as a virtual one where it is now possible to meet characters coming from different virtual universes. The two films will be mirroring each-other. Although the pictures will be distributed through different medias. Berardo Carboni who previously shot Shooting Silvio, wrote the script in collaboration whith the writer, Mario Gerosa author of the book Virtual Words and Second life, currently on its third reprint, chief-editor of “AD, architectural digest italia-” magazine and professor of cultural planning of the territory and comunication at the “Politecnico di Milano”. Berardo Carboni. is also working on the direction of both parts of the production. 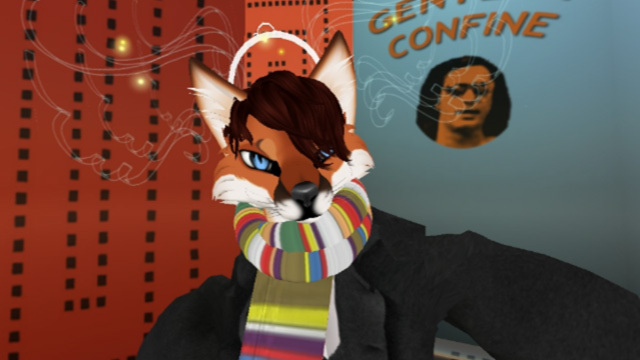 Nicolas Barrial (Nick Rhodes in SL) build the virtual representation of La Cantine in Second Life. La Cantine is a creative, experimental and innovative space dedicated to digital technologies, located in the center of Paris. Both a place of exchange and a technological showcase, La Cantine is open to professionals, tech enthusiasts and everyday users. This place is dedicated to ascending innovation welcome all contributors to digital life. La Cantine favors the conception and emergence of new uses, products and services by accelerating ideas, creation and networked innovation. A true collaborative platform, La Cantine is a new space for sharing experience and skills (co-working, art-oriented platforms, alternative venues, competitive clusters, specialized research labs, colleges and universities). This desire to share and find new ways to collaborate made it natural to extend its activity to virtual worlds. One of the main partner of La Cantine being Orange, Orange Island sounded like the perfect place for implementation of the virtual Cantine. At “La Cantine Virtuelle”, you will attend mixed reality events with partners in Paris but also find content of innovative projects. Entry filed under: Dorkbot, electricity, media art, second life. expects power generation to reach 3,845 GWh by 2020 from 3,020GWh in 2011. Program, the California Energy Commission and the Department of Energy. the result is used to manufacture fertilizer pellets for farming.